I have long wanted to devote at least a line or two to the subject of the plans to build a cascade of hydroelectric power stations on the river Argun in western Chechnya. However, I have invariably postponed it – there is always something happening in Chechnya and Russia, increasingly with distinct implications of disaster. And although the explosion at Russia’s Sayan-Shushenskaya hydroelectric plant in Eastern Siberia on August 17 was a tragedy of shocking proportions, I will not discuss it now, as I do not believe there will be a more convenient pretext for talking about the “Argun project". My main profession is hydraulic engineering. At the Institute I was taught how to construct a dam, how to block a river and how to build a reservoir – for agricultural purposes, let me stress. 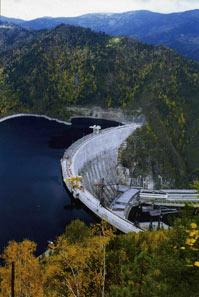 Hydroelectric power is different, of course. The difference between it and what I was trained in is as great as, for example, that between flying a jet aircraft and a biplane. The two modes of flight involve different heights, different speeds, different levels of technology. Accordingly, the training of pilots in each case is different, too – but the underlying principle is the same. Likewise, it was easy to move from my faculty to a school that trained specialists in the field of hydropower, as the same branches of science were involved: mathematics, physics, geology and hydrogeology. One of the most important subjects we were taught and made to study was ecology. Any reservoir, regardless of its size, has an impact on the surrounding natural environment and causes changes in the local climate. In some cases this leads to disastrous consequences: the salinization or waterlogging of soils, increased humidity and temperature changes. The winters become more dank and the summers hotter, which in turn does not have a very positive effect on vegetation and animals. Some species of plants around artificial reservoirs may disappear altogether. People’s living conditions usually change for the worse. In waterlogged areas, for example, there is often an increase in the numbers of blood-sucking insects which carry diseases of various kinds. It was for this reason that during the Soviet era the as then yet not quite Chechen-Ingush leadership of the Chechen-Ingush Republic decided not to build any hydroelectric plants. A similar plan was thrown out during Dudayev’s presidency, though on that occasion the reason was not only ecological considerations but also the interests of local families. The land where the power stations would be built belonged to people whose ancestors were buried in it, and in order for the “prestige” projects to go ahead, the land would have to be flooded. No one wanted that back then. My ancestors hail from Chechnya’s Shatoysky district, and so for me the reports of plans like these are a bit like a stab to the heart. The Argun Gorge will inevitably be subjected to a “mopping-up operation”: the slopes of the surrounding mountains will be freed of forest and bush. After all, hydroelectric turbines have no greater enemy than tree trunks that have fallen into the water, for the higher the pressure on these same turbines, the higher the output of electricity. Pressure is created by damming the volume of water, and so it is best for the reservoir to be a large one. I wonder what area is going to be flooded? Even though it is uninhabited now, I would not like the village where my grandfather and his two brothers grew up to fall within the flood zone. I am, however, troubled less by the scheme’s nostalgic implications than by its doubtful economic viability. This project could change beyond recognition the face of the small piece of land we Chechens can our own. I don’t believe that the scheme is viable in economic terms. Small hydroelectric stations, even if arranged one after the other in a cascade or even in clusters, are not capable of providing energy that is required, not only for delivery to other regions, but also to meet all the needs of the republic. An increased output of electricity is not obtained by the simple addition of volts obtained here, there and somewhere else nearby. In order to produce enough of it, one must burn a certain amount of coal and fuel oil, or apply a certain pressure of water to the turbines. Cascades will not help, especially from small stations with a small volume of water collected in dams. Initially, of course, extra hands will be needed for the construction work. New jobs will be created, and some of the republic’s citizens will have a salary. This can be counted as one of the project’s advantages. But how long will the good times last? Maybe five years, if Moscow does not cut the funding. Two or three thousand people will be needed to man the stations when they are built, including security. In the end, almost the only advantage turns into a big disadvantage – a forever mutilated natural environment, a not very large number of "beneficiaries", and profits that flow straight past the noses of the republic’s citizens into the pockets of the company that goes by the name of "RusHydro “. Like a hydra, “RusHydro” controls all the hydropower stations in Russia, which like nuclear ones are considered strategic assets. They can not be owned by any private person or individual region, republic, or territory. They can only belong to the state. This, I believe, is where we must seek the meaning of the Argun construction project (unless we also include the aspect of corruption), which lies almost entirely on the plane of political expediency.